While most people are thinking of upgrading their computer, it remains that several preventive maintenance measures such as the usual hard drive defragmentation are still reliable if you sometimes wonder why your computer suddenly slows down. Similar to the old practices, we cannot avoid system crashes or sudden cases of lost files owing to unforeseen circumstances such as power failures or forced rebooting. These instances are the main reasons why lost fragments are often present in computers. Improper shutdown of your computer will always provide problems and most of the time they will be identified once your computer starts to slow down. We can always take the fast way out. Placing additional memory chips or upgrading to a higher processor is a good idea. But do remember, they are alternatives that you can save on if you think logical. Sometimes the problem is not in the hardware but the people-ware who do not know the standard means of maintaining their computer system. It would be wise to schedule your defragmentation practices. They can really do a lot to improve your operating system and make sure that you get the best performance for your computer. Defragmenting your hard drive is the process of putting all the scattered pieces of files back together. Microsoft Windows XP includes a tool that will defragment your hard drive for you. To keep your system performing well, it’s a good idea to have Windows XP automatically defragment your hard drive every week. Now to set the ball rolling.. What is Superfetch? To make the Story short, SuperFetch analyzes your behavior what programs you use often, then caches it and loads to memory for a faster loading next time you you use that specific program. And team it up with ReadyBoost expect a memory boost because it draws memory by extending Superfetch’s memory management by drawing available memory from a USB 2.0 flash drive to ensure that there is enough memory is available for optimum system and program performance. Here’s some good news for laptop enthusiasts and modders. Samsung has recently announced its latest 1.8-inch solid-state disc (SSD) with capacities up to 64 Gigabytes. Sure, you can get hundreds of gigs’ worth with today’s laptop hard drives. But with this one, you get the advantage of solid state technology. This means lower power consumption, and less likelihood of moving parts crashing. And it’s reportedly faster than regular laptop 5400 RPM or even 7200 RPM hard drives. The SSD is based on an 8-gigabit and single-level cell NAND flash technology, which means it should outperform traditional flash-based solid-state technologies. The read and write speeds have improved by 20% and 60% respectively, compared to the 32GB SLC-flash based drives that Samsung introduced in 2006. 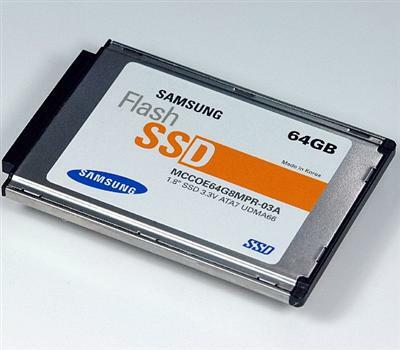 Samsung also foresees that aside from being ideal laptop hard drives, these SSDs would likewise be ideal storage solutions for other mobile devices like PDAs, digital camcorders and personal navigation systems. Once Samsung develops hundred gigabyte-level SSDs, these will also be marketed for use with servers. These hard drives are meant to be drop-in replacements, meaning they can be plugged in to existing laptop parallel ATA ports. Samsung plans to begin production of the 64GB SSD by second quarter of this year. Reading through my favorite pc forum sites, I encountered this thread about mounting your hard disk drives backwards .For many casual PC users the concept of mounting a hard drive backwards may sound very strange and even impractical. First of all, practically everyone has seen hard drives inserted only one way, with the pins sticking out into the inside of the case and not facing the front of the case. For them, the very idea alone will be quite hard to grasp. Secondly, with the pins facing the front of the case, it will be virtually impossible to get at the pins and cables without physically removing the hard drive from the hard drive bays – a very cumbersome task. But why do PC case modders do this? For the very simple reason of better cable management. By actually putting the hard drive backwards all of the pins will be hidden by the drive bay and the front of the case, what you end up seeing is the front of the hard drive itself which is just one smooth and level piece. From an aesthetic point of view, it is a definite winner. I have seen a modded case that used this kind of solution and it really does look pretty. Additionally, putting the cables at the front allows for more creative solutions to actually hide those cables from view, which results in a very clean looking case. I have seen one modder do this and he was able to manage the cable in such a way that at first look you would think he was not using any cables except the wires that run from the PSU to the motherboard. It looked absolutely awesome. Author PC FreakPosted on December 10, 2006 Categories Case Mods, Cooling, Hard Drives, News, Style1 Comment on Mounting hard drives backwards? I have always contended that there should always be a way to make it easier for a person to do research or to find the information that he needs without jumping from one website to another. The most rudimentary of researchers will already tell you that researching for needed information is not as easy as it looks. When you research on the internet you need to employ so many skills. You need analytical skills in order to think of the best words and phrases you can use as search strings for your research. After you have received the results, you will need to use your detective skills in order to pinpoint the information that you will really need amidst the tremendous amount of pages that could possibly be generated by your search.A central repository of needed information is thus a very welcome concept and one that I am constantly on the lookout for. Whenever I do encounter sites or pages like these I immediately bookmark it for future reference. It was a pleasant surprise when I saw this particular forum section in ocforums.com. The series of FAQs on various important topics that are PC related will definitely be a great help for those who are still new to PCs. The various threads in the subsection tackle practically all of the important topics that newbies will likely ask, like questions regarding drivers, power, storage, memory, among others. This is a great resource especially for those who are still quite unfamiliar about how computers work. A good read of the threads would be enough for a person to actually learn the basics of at least taking care of their PCs.